Elephants have apparently realized there's only one predator they really need to worry about, and that would be us humans. Despite the lack of fences marking the boundaries of Tanzania's Serengeti National Park, elephants overwhelmingly stay on the safe side. Researchers wanted to figure out the emotional state of elephants both in and out of the park's protected areas, and that meant only one possible thing: time to go sifting through elephant poop. Dung collected from both sets of elephants revealed that those living outside the national park, where they were at much greater risk of hunting and interference from humans, were more stressed than those living inside it. The manure found outside the park had significantly higher levels of gluccorticoid, a hormone produced during times of stress. Basic demographics also help tell the story, as elephants were found in much greater numbers inside the park than without, even though there were no visible boundaries marking off the two regions, and there are no concerted efforts made to keep the elephants inside the park. What's more, no single male elephants were observed living outside of the park, indicating that when elephants did venture into more dangerous areas, they did so as family units. "The reason is most probably that elephants try to avoid human-elephant interactions. Elephants probably remember where they are, and that bad experiences stress them. I think elephants know where they are safe or not. However, sometimes they also are tempted by nice food outside the park which attracts them to such areas." "The biggest threat to African elephants and other wildlife is the human population increase outside all such parks. Humans need food, and wildlife is cheap and easy. Therefore the pressure on such animals increases. 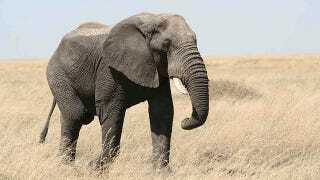 The elephant population in Africa is presently declining at an alarming rate. The world must find interest in it, if not there will be very few or no elephants in Africa in about five to six years." African Journal of Ecology via BBC News. Image by gudi&cris on Flickr.